I have on several occasions been welcomed into the homes of near-strangers: friends of friends around the US and further afield as well. In that vein, someday soon I'll write a post about how I came to know Christine and Big John (plus their cat, Dewey), as well as their broader community of people loving life and looking after one another in the Pacific Northwest. However, today's mission is a comfort food recipe, and Chris and John came through with style! 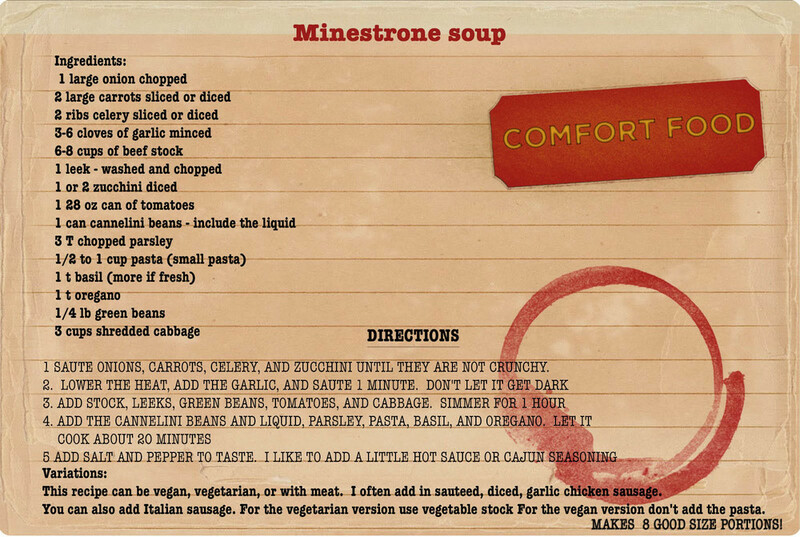 This minestrone soup (passed on by their friend Eileen Ramerman) is simple and delicious, and will last for days for delicious leftover meals. "taking the time to make a big batch of homemade food can not only be comforting but can also de-stress your life. I never mind eating the same thing several days in a row because it's so much easier than having to shop, plan, and cook every day. " I don't want to speak for Christine and John, but an added piece of wisdom they offered me was the value of hospitality. I was invited to "pass on" their hospitality someday when a college student arrives at my door, looking for a few square meals and a chance to explore some new city. I promised them I would, and plan to make good on that happy obligation! Thank you so much for the words, Christine, and to both of you for today's comfort food!